The Honda HR-V subcompact crossover, introduced for 2016, is one size smaller than the CR-V, and is based on the versatile and economical Fit. It looks a bit sportier than the CR-V, and more like an SUV than the swoopy and aerodynamic Fit. It’s essentially unchanged for 2017. There is one engine, a 1.8-liter four-cylinder that makes 141 horsepower and 127 pound-feet of torque. Front-wheel drive is standard, all-wheel drive is optional. The HR-V is comfortable to drive, and it can be fun, but it isn’t what we’d call sporty. Its versatility and economy are what make it a great choice in a subcompact crossover. Competitors include the funky Fiat 500X, sporty Mazda CX 3, and the Chevy Trax that shares a platform with the upscale Buick Encore. Most models come with a continuously variable transmission (CVT), but a six-speed manual is available with front-wheel drive. The CVT gets better gas mileage, its reason for being, though it’s lame from a driving standpoint; it’s EPA-rated at 28/34 miles per gallon City/Highway, or 31 mpg Combined, with front-wheel drive. That essentially ties with the best in class Mazda CX-3 that gets a half-mpg better. The HR-V was carefully designed with versatility in mind. The cabin is clean and well organized, with a nice center stack with an optional big display. The roofline is curved for more headroom. The rear passengers have plenty of hip and legroom. The HR-V steals the popular features of the Fit, like the fold-flat 60/40 rear seat, and the Magic fold-flat front seats. A flat cargo space behind the front seats, and a dropped front seatback, makes it like a minivan. With all-wheel drive and a roof rack, it’ll do anything. The HR-V is perky and blunt, a smooth blend of hatchback and coupe. Honda says it’s designed to look like a coupe, with its short overhangs, sharp creases and aggressive angles. From the front it resembles the larger CR-V, but with a wider front grille and a stronger nose. From the side, the curved roofline is punctuated by a roof spoiler. A sharp, rising character line runs from the door up into the D-pillar. In the rear, a strong crease swoops from the outside of each tail light, creating a wide grin. The cabin feels heavy on fabric and plastic. The controls are well laid out, with a five-inch touchscreen on the center stack, and better seven-inch screen on the navigation model, that’s perfectly located in the high center console, that helps separate the driver from the front passenger. Below the center stack there’s a small storage space that can fit a phone, with a USB port. The door pockets are wide and shallow. Rear visibility is good despite a small rear window. When you get used to Honda LaneWatch, it’s helpful. When you flip the turn signal, a screen shows the rearward view of the side of the car that’s turning, from the pov of the sideview mirror. If you go by total interior space, more than 100 cubic feet in the LX, the HR-V is the roomiest vehicle of its kind. In the rear seat, adults have excellent headroom and legroom. The 60/40-split rear seat can fold completely flat, and Honda’s Magic Seat that folds and flips the second-row seat like a lawn chair. The rear cargo is square and flat with a ton of space. With the seats up, there’s a fat 25 cubic feet of cargo space; with them down, there’s 58.8 cubic feet. Compare to the Chevy Trax, with 18.7 cubic feet and 48.4 cubic feet. The HR-V feels gutless when the throttle is punched, thanks to the continuously variable transmission, which lags between shifts. However, on the EX models there is a sport mode that brings a bit of snap to the shifts, and using the paddle shifters helps a lot. Thank heavens they are there, to salvage some fun out of driving the car. Overall, the engine is adequate; remember you’re getting 31 mpg combined, and it is an SUV after all (with awd the combined mileage is 29 mpg). With the manual transmission, the acceleration feels fine, zipping around town and out on the highway. However it gets 3 mpg less, at 25 city, 33 highway, and 28 combined. But give Honda credit for offering it, as an option to their unexciting CVT. If only they built a CVT with as much feel as Subaru. The HR-V is designed for commuter driving, not hotrodding or offroading, so the ride is better than the cornering. The body motions are well controlled, and it never feels brittle, even on terrible roads. The suspension uses struts in front and a torsion beam in the rear, with standard 17-inch wheels; it’s more absorbent than that on the Fiat 500X, Jeep Renegade or Chevy Trax. As for handling, it’s adequately confident and balanced, although far from entertaining on a twisty road. The steering is fairly relaxed. If cornering is what you want in a small crossover, the Mazda CX-3 is the way to go. 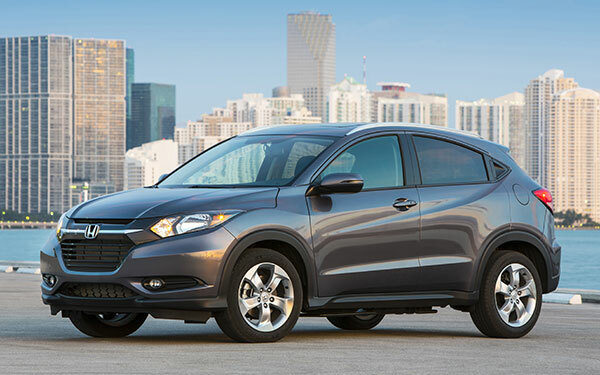 The HR-V is a great addition to the subcompact crossover class. It’s exactly what Honda bred it to be: a cross between the Honda Fit and CR-V. It’s not exciting to drive, but it is exciting in its ability to do and especially carry so much, while getting 30 mpg.